2019 marks an important year for Karen armed struggle for self-autonomy in many ways. On January 31st, we will celebrate 70th anniversary of the Karen Revolution Day, a day when Karen people first launched their armed movement against the government of Burma in 1949 for an autonomous state. This year celebration also marks an important moment in the unity of the Karen armed groups. For the first time since their breakups more than two decades ago, the Karen armed groups – the Karen National Union (KNU), Democratic Karen Benevolent Army (DKBA), Karen Peace Council (KNU/KNLA), together with the Karen Border Guard Force – will celebrate the Karen Revolution Day and perform joint military parade in a show of force and unity. And more importantly, 2019 could also be a make or break year for the Karen armed struggle. The Burma’s peace process, of which the KNU has heavily invested its energy in the past seven years, has stalled and KNU’s future involvement in the process has become uncertain as it has recently suspended its formal participation. At 70 years, the Karen armed struggle against the Burman-dominated government in Yangon, and now Nay Pyi Taw, for self-autonomy is one of the world’s longest running civil wars with no end in sight. In the 70 years, tens of thousands of Karen freedom fighters have sacrificed and lost their lives while ordinary Karen people have endured and withstood years of brutal war, killing, and human rights abuses. Despite of all the difficulties and untold suffering, the Karen armed struggle is still alive and proudly standing. Howerver, after 70 years and plenty of ups and downs, it is important for us to seriously reflect as we prepare to march on. It is important for us to look back to the past, understand the present, and consider the future, as we try to fulfill the dreams of our fallen heroes. The Karen armed revolution is in some way a byproduct of legacy born out of the chaos following the withdrawal of the British colonial government from Burma after the Second World War. Although the Karen wanted and demanded an independent state of their own, few thought or foresaw an armed revolution against the government until it began. The Karen hoped to achieve its dream through a false promise by its British ally, and when that failed to materialize, through peaceful negotiations with the government. However, mistrust and hostilities ran deep between the Karen and Burman communities during and after the war. The newly independent government and Burmans at large did not trust the Karen and resented their support of the colonial government. The Burmans saw the Karen as traitors and colonial lackeys because the British government generally preferred to work with the Karen during the colonial rule. In reverse, the Karen did not trust the Burmans and the new government due to historical animosity and their abuse of the Karen during the Japanese occupation of Burma. Consequently, these two combinations created mistrust and revenge that led to open hostilities and communal violence between the two communities following Burma independence. Attempts by the government to seize weapons from the Karen who had fought with the British government only made things worse as the Karen feared for their security and further retaliation from the new government. The Karen National Defense Organization (KNDO), the first organized Karen militia organization, was founded to protect and defend the Karen community from a hostile local Burman community and the Burman-dominated government in Yangon. When communal violence and hostilities broke out between the Karen and Burman communities, Karen leaders tried to scale back the conflict through negotiation in the hope that armed conflict would be avoided. However, instead of resolving the conflict peacefully, Burman militias and the new government in Yangon decided to attack and disarm Karen militias and the KNDO in the town of Insein on the night of January 31st, 1949. The attack was the first real armed conflict between Karen and Burmans as well as the start of the Karen revolution. For the Karen, the military assault on Insein against them was a major turning point because the attack was seen as a battle for survival of the Karen race in their impending war against the Burmans. Despite lacking proper preparation and resources, there was no turning back for the Karen as the attack left them with no choice but to resist and fight back. The Karen managed to push back and advanced within miles of the Yangon based government. Many Burmese historians agree if the Karen had managed to overrun the government position and take Yangon, it would have significantly changed the history of post-independent Burma and the history of the Karen revolution altogether. However, due to U Nu’s shrewd negotiation and maneuvering skills, his government was able to convince the Karen of a temporary truce while he secretly looked for support and reinforcement from the outside world. The government used the negotiation period to secretly reinforce its forces, to cut off supply routes and block all channels of Karen reinforcements from reaching its soldiers based at Insein. The Karen fighters and the KNDO did not expect any help from the outside. As a result, after 112 days of fierce fighting and over 500 lives lost, the Karen fighters were finally defeated and driven out of Insein. With this defeat and retreat, victory slipped out of their hands and the Karen never again came close to reaching and threatening government power. While the retreat from Insein was an early blow to the Karen resistance movement, a serious loss for the Karen came in August 1950. Saw Ba U Gyi, the acknowledged father and founder of the Karen National Union and Karen revolution, was ambushed and killed in Tok Kaw Koe Village, Karen State, by government security forces. Saw Ba U Gyi was everything for the Karen revolution. He was the brain, the body and psychological leader of the Karen struggle and his death dealt a devastating blow to the KNU’s leadership and spirit of the Karen revolution. At age 45, most Karen agree that Saw Ba U Gyi ‘s untimely death was a serious loss for the Karen resistance movement because he was considered the most sophisticated and well-versed leader in politics, military, governance and modern international affairs. Besides his university education and intelligence, he was also a true Karen patriot who was willing to sacrifice his wealth and gave up everything for the Karen cause. His four famous principles – one of which is to never speak about surrender – have firmly laid the foundation and guided the Karen revolution for 70 years. We could not exactly predict how the Karen revolution would look like today if it was not for Saw Ba U Gyi’s assassination, but most Karen believe that had he been able to lead the Karen revolution, the outcome would have been different today. The loss of Saw Ba U Gyi dealt a serious blow to the leadership of the Karen revolution, but did not derail or stop the Karen people from marching on. For the years following Saw Ba U Gyi’s death, the Karen National Union and Karen resistance movement grew, spread east, and became a dominant political and military force opposed to the central government in Yangon. For forty years, from 1950 to 1990, the KNU was able to control large swath of territories from Bago Region to Karen State and Tanintharyi Region while at the same time sheltering and nurturing other ethnic armed groups and democratic forces resisting the military regime in Yangon. Considered the most organized of all the ethnic armed group with a strong and sizeable military force, for many years the KNU was able to challenge Tatmadaw [aka Burma military] power and effectively serve as a de facto government along the border regions of south eastern Burma. Under the KNU’s leadership, the first pan-ethnic military alliance – the National Democratic Front – was founded in 1976 to bring together Burma’s ethnic armed groups as a united front against the military government. For two decades, Manner Plaw – the headquarters of the KNU – served not only as the stronghold of the Karen rebels, but also as a symbol of the ethnic and democratic forces resistance movement. Many ethnic armed groups and democratic organizations were hosted, trained, and nurtured in Manner Plaw as opposition forces to the military regime in Yangon. Beginning in the early 90s, the strength of the Karen resistance movement began to slowly weaken as many KNU’s strongholds along the Thai-Burma border were captured by the government forces. The loss of these strongholds and territories deprived the Karen resistance movement of the revenues and income generated through black markets and cross border trade with Thailand. The defection of the KNU’ ethnic allies – the Kachin Independent Army and the New Mon State Party – to the government in the early 90s was a major loss to the Karen resistance movement, leaving the Karen to face the Tatmadaw’s offensives alone. Without other threats to worry about, the Tatmadaw was able to fully concentrate its attacks on the Karen as their former allies watched on. However, the loss of its ethnic allies was not the most devastating blow to the Karen resistance movement – an internal breakup helped cripple the Karen. The splint of the KNU in 1995 along religious lines and the subsequent formation of the Democratic Karen Buddhist Army caused massive damaged to the Karen resistance movement and caused serious disarray in the KNU leadership. The breakup led to the fall of the Karen symbolic stronghold, Manner Plaw and effectively reduced a third of the KNU’s fighting strength, especially its military force. The breakup and the subsequent loss of Maner Plaw in 1995 paved the way for more challenges and problems down the road. The loss of KNU’s headquarters resulted in the weakening of its central control over its seven administrative districts and military brigades. Consequently, this led to further revolts and defections as some disgruntled and opportunistic local Karen military commanders began to challenge KNU’s leadership and struck out secret deals with the government. Some of the most prominent ones were the defection of KNU’s Brigade 6 battalion commander Colonel Thu Mu Heh in 1996, the KNU’s finance minister Padoh Aung San faction in 1997, and the breakup of the Brigade 7 led by General Htin Maung in 2007. Once the strongest of all the seven KNU’s military brigades, the defections and splints had effectively reduced Brigade 6 and 7 to the shadow of their former self. As a result, the KNU and Karen resistance movement were never able to recover its former strength to challenge the Tatmadaw power and reassert control along the border regions. Under Burma successive military government, it had always been the policy of the KNU to resolve political and military conflict peacefully through honest and sincere negotiation. But this was repeatedly ignored by the government as the Tatmadaw insisted on disarmament and continued to attack the KNU’s territories and Karen civilians along the border regions in an effort to wipe out the Karen resistance movement. But years of persistence external pressure in the form of economic sanctions and isolation forced the military government to relent and pursue political reforms and peace with ethnic groups to ease international pressure. This led to the introduction of quasi-democracy in 2011 by the military government and the initiation of peace talks with the KNU and other ethnic armed groups. But Burma’s democratic reforms and peace talks between the government and ethnic armed groups also presented the KNU with major challenges and opportunities, ones that it needs to tread carefully with. Peace talks and subsequent nationwide ceasefire agreement eased military pressure on the KNU and Karen civilians as fighting had mostly stopped in most parts of the border regions. As a result, freedom of movement and some level of normal life and security have returned to many parts of the KNU’s controlled territories for local Karen communities. In return, the KNU has become an important player in the government peace process. And although mistrust and occasional military skirmishes between the Tatmadaw and the Karen National Liberation Army still flare up, the ceasefire agreement between the government and the KNU mostly hold. But despite best efforts by the KNU to engage in sincere and honest talks with the government under the terms of the National Ceasefire Agreement, little progress has been made on the political and military front for the Karen. After seven years, the peace process and promised political negotiations have stalled now due to Tatmadaw’s insistence on disarmament, a single army, and adherence to the 2008 constitution before any further negotiation can progress. Meawhile, none of the Tatmadaw’s bases in KNU controlled territories hav been removed. Instead, the Tatmadaw has reinforced and upgraded its military bases and roads inside the Karen territories by taking advantage of the ceasefire agreement. The Tatmadaw continues to repeatedly violate the terms of the ceasefire agreement by intruding in KNU’s territories and ignoring territorial boundary and military code of conducts – this resulted in armed clashes between the Tatmadaw troops and the KNLA. Despite military and political progress between the government and the KNU stalling, the government has taken the opportunity to spread its influence in KNU administrative areas in the form of education and management of the local administration. Many villages and schools now come under partial or direct control of the government. Karen schools are now staffed with Burmese teachers and students are required to learn Burmese language and history instead of local languages and history. Economically, local Karen communities have benefited little from the peace process other than some freedom of movement to travel to and from and to buy and sell. Instead, it is the big companies and local ‘influential’ figures who have reaped the economic benefits by displacing local communities in the form of land grabs under the guise of ‘development projects’. In the past it was uncommon for communities in Karen State and along the border regions to have contact with Chinese traders and Chinese companies. Today, the Chinese influence is felt in the form of local investment and development projects in collaboration with some ‘influential’ and self-serving Karen leaders. This has created fear among local communities that Karen State, especially the areas under KNU’s controlled, are becoming commercialized and this will undermine the already diminished Karen resistance movement. A lack of unity and policy cohesion in its approach to the peace process and negotiation with the government has made the Karen position weaker and easier for the government to take advantage of. The government’s divide and rule tactic has created and exacerbated internal tensions within the KNU leadership and among the Karen communities as the peace process fails to achieve its objective. The recent suspension of the KNU’s formal participation in the peace process has confused Karen communities. Despite the suspension of the peace talks the KNU and the government continued to hold informal meetings, but the KNU failed to communicate with its people what it’s policy direction is. After 70 years, the Karen resistance movement is at a crossroad and is in real need of renewed spirit, fresh thinking, a new sense of purpose and a clear direction as it is confronted with new challenges on multiple fronts. The Karen once controlled large swathes of territory and boasted tens of thousands of soldiers that resembled a mini state, but today we can barely defend our military bases along the border. While the peace process has not taken us anywhere closer to our goal, the greatest threats to our struggle maybe no longer be the Tatmadaw and their guns. As Burma opens up and globalization takes hold in remote part of the country, we are also faced with economic and soft power threats that could slowly destroy our movement. And while some of us still feel strongly about the Karen struggle and manage to stay true to the Karen revolutionary spirit, others are becoming aloof, disengaged, divided, and drifting aimlessly away from the Karen movement’s original purpose. With this in mind – after seventy years and tens of thousands of lives maimed and lost – it is only appropriate that every Karen, from all walks of life, ask themselves what we truly want and what we are fighting for? Are we fighting for autonomy or political and economic equality? Federalism? Economic opportunity? At this juncture, the Karen struggle may be neither lost or victorious. Despite setbacks and obstacles, we’ve endured and survived 70 years of untold suffering and misery and we should be confident that we can carry the struggle on. But faced with new challenges on multiple fronts – from both hard and soft power threats – our struggle is also in danger of disappearing as it is losing its sense of purpose and direction, fragmenting within, and lacking a strong united spirit. 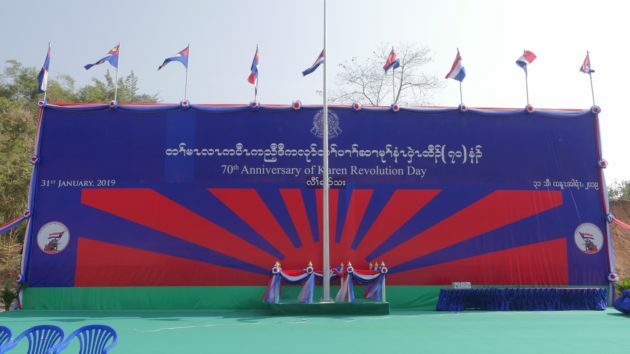 As we celebrate seventy years of revolution, more than ever, the Karen movement is in need of a sophisticated and strong leadership to lead and steer the Karen revolution. It needs new ideas, fresh thinking, and a leadership that can inspire national spirit, bring unity, and instill a sense of hope and purpose in the Karen people. It needs to be a leadership that understands the complexity of the problems and challenges that confronts us, and a leadership that can also use negotiation skills to advance the Karen cause. Importantly, it has to be a leadership that is not afraid to confront and challenge our adversaries when needed. The Karen resistance movement desperately needs new energy, new spirit, and most importantly, support from the Karen people to continue. Without community support – from inside and outside – the Karen movement will not be able to survive its arduous journey and to succeed. An able and sophisticated leadership alone will not be enough to bring our movement victory unless we all rally behind and do our part to help shoulder the burden. We must recognize our own weakness and understand that our failure is mostly of our own making. After 70 years, instead of uniting, we are still internally as divided and fragmented as ever – this is true of our armed groups, our leadership and our communities. Unification of our different armed groups is still as elusive as it has ever been. And as long as our communities, our armed groups, and our leadership remain divided, victory will always remain out of our reach.